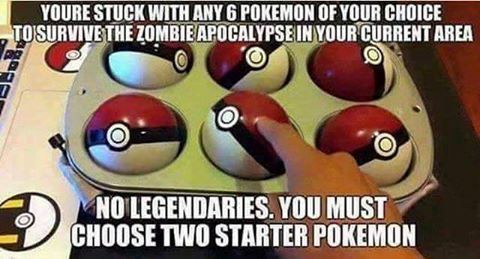 For sure I would take Charmander for the flame-throwing capabilities, but for the second starter I was thinking about grabbing Squirtle. Gaining access to clean water would be one of the biggest challenges you would face in a zombie apocalypse, and Squirtle's water gun could be a very easy solution. Question is, is that water potable? I'll answer this with an answer I found here via a user by the name of ItalianRapscallion. My guess is no, because if you are materializing water from thin air, would that pokemagic create minerals / salt at normal levels too? It's probably pure water, maybe a little saliva mixed in depending on the aperture from whence it came (but if so it wouldn't be enough to make a difference). In other words, drinking it would leech all the minerals and saline out of your cells, it wouldn't hydrate you, and if you drank enough you would eventually explode on a cellular level. Edit: further mulling made me realize an easy test, (which i don't recall from the show) Do we ever see electricity travelling along water spewed from a water pokemon? If so, the water is conductive, i.e. mineralized, therefore you can probably drink it. In all honesty through my searches of the web, I haven't found anything conclusive on the topic, so we can put it in a grey area, in which we are never really sure of the answer until we can see it for ourselves. That said, the fact that Water Type Pokemon are weak to Pokemon of the Electric Type, it is safe to assume that the water they produce does indeed contain the minerals and nutrients it requires. My conclusion is that: It should be safe, however we can't guarantee it for multiple reasons, so keeping a Squirtle would be a good idea, though try to bring a form of filter with you, for a safety precaution. You're in an apocalypse, so water sources other than rivers, the ocean, ransacked stores, etc, is not going to be the most reliable in a city environment, though in the countryside you have more chance of finding natural bodies of water. It might be dangerous water, rather than distilled water, coming from the Pokemon. I say again, bring a water filter of some sort, as well as a Squirtle, to ensure your own safety.